A policeman was early Friday morning arrested after he was caught tossing a plastic bag containing several prohibited items at the Lusignan Holding Bay next to the prison, Director of Prisons Gladwin Samuels said. The bag contained seven packs of cigarettes, one cellular phone, one cellular phone and one charger. Commending police and prison guards who were on duty at the time for their swift response, Samuels said at about 4:18 AM, the policeman , who as slated to work at that location, went next to the fence. 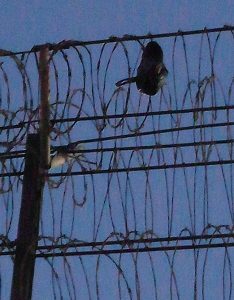 “While there, he attempted to get a black plastic bag over the fence. He was observed and the ranks raised an alarm and promptly arrested him. The bag however got caught on the fence and was retrieved by the ranks on duty,” the Director of Prisons said. The policeman has since been handed over to his colleagues who escorted him to a nearby police station. 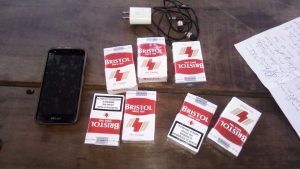 His arrest came one day after the Guyana Police Force said a joint service search of the Georgetown Prison netted several prohibited items including numerous cellular phones and chargers and improvised weapons.